For more than 100 years, the American Red Cross has been training people to perform first aid skills so they could save the lives of others. Now, the organization announces the release of its new Cat and Dog First Aid online course so that owners will know what to do in an emergency until veterinary care is available. People can access the course on their desktop or tablet at redcross.org/catdogfirstaid and go through the content at their own pace. It takes approximately 30 minutes to complete the course. Participants can stop and pick up where they left off if Fluffy needs a treat or it’s time to take Fido out to the dog park. Information on preventative care, health, and tips for a pet’s well-being. 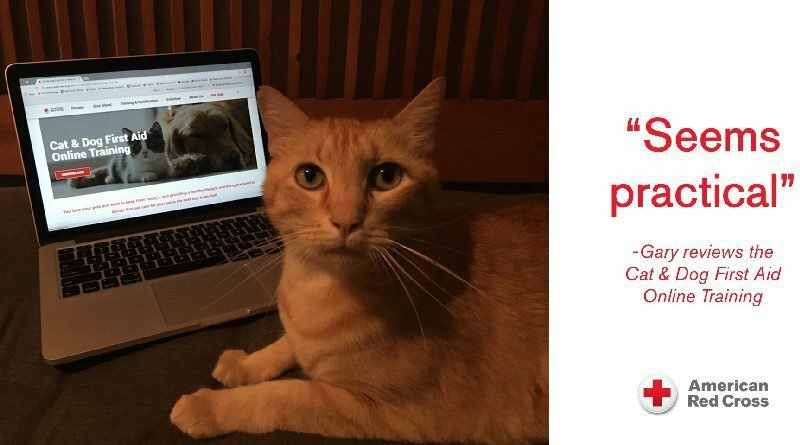 The Red Cross Pet First Aid App complements the course by providing cat and dog owners with instant access to expert advice, an animal hospital locator, pet-friendly hotels, content on how to include pets in family emergency preparedness plans and more. The app can be downloaded for free in mobile app stores or by texting ‘GETPET’ to 90999. American Pet Nutrition is a proud sponsor of the Pet First Aid App. The American Red Cross shelters feed and provide emotional support to victims of disasters; supplies about 40 percent of the nation’s blood; teaches skills that save lives; provides international humanitarian aid; and supports military members and their families. The Red Cross is a not-for-profit organization that depends on volunteers and the generosity of the American public to perform its mission. For more information, please visit redcross.org or cruzrojaamericana.org, or visit us on Twitter at @RedCross.